This simple axe can be used as either a one-handed or two-handed medieval axe. The styling is primitive and authentic for a piece of the early medieval period. 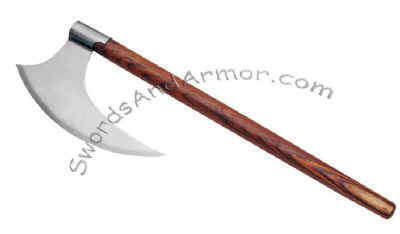 It has a carbon steel blade and satin finish solid wooden handle that is made from and exotic hardwood. There is not a sharp edge on the blade. The item is 27" long.